You can either click on the menu symbol found in the top right of your screen and then click Options. Or you can open a new tab and select Options from the bottom icons. 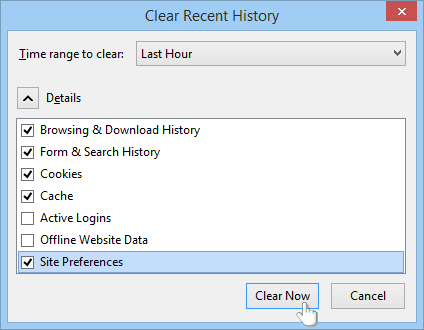 Then click on the Privacy tab and select clear your recent history, highlighted in blue. The following window will appear confirming that you wish to clear the ticked boxes. Press Clear Now, then OK when it returns you to the previous screen. Try logging into the website again and you should have no problems.